egin your process by arranging all your products in an easily accessible manner. In order to create an ergonomic layout, you must first analyze your past records to understand your consumer's buying behavior as well as data that can provide you with details related to popular products and product combinations. This will help you create a plan that makes the restocking and the shipping process easier and faster. The best way to efficiently manage inventory is to stock only what is needed with a minor margin in case of excessive demands. Hoarding inventory ties up a cash and other resources that can be better used for other products. This can be done by setting par levels for each of your products. Par levels essentially are the minimum amount of stock that must be on-hand at all times. So, the moment your inventory levels drop below it, you know it's time to re-order. Monitoring par-levels is also important as lack of inventory during a surge in orders may lead to customer dissatisfaction, subsequently affecting your brand image. 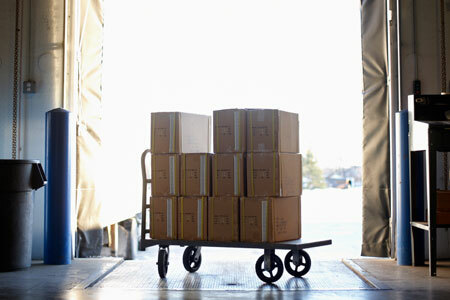 While handling stock, weight and quantity play a big role in the inventory purchase and restocking process. Pre-installing weighing equipment such as truck scales and conveyor belt scales simplify the inventory delivery process by providing you with weight and quantity data on the spot as opposed to replying on leasing or renting such scales every now and then. Not only does it enhance productivity, it also turns out to be extremely economical and helps save operational costs in the long run. In order to stay on top of all your operations, you must invest in inventory management software will allow you to receive regular updates of your business's output. This is because inventory management software records every aspect of your day-to-day operations in the form of quantitative data. This is also beneficial when you have to conduct audits or identify process gaps and loopholes, as the data it records lets you get to the crux of the problem and implement control methods, even allowing you to micro-manage if the need be. With the rise in the application of automated solutions, you can customize your inventory management software to allow integrations with automation equipment. Automated technology such as AVGs, sorting conveyors, and robots allow you to seamlessly conduct operations with minimal supervision. The best way to implement the practices mentioned above is to plan the flow of operations. First, plan your process in order to ascertain your requirements in terms of inventory, as well as manpower and resources required to handle it. Once you have your staffing requirements in place, organize your cash flow and other resources to accommodate your needs and get your operation started. With time, you will be able to identify the key-result areas as well as the areas that require added supervision and will be refine your process to achieve the desired quality of output. Kevin Hill heads up the marketing efforts and provides technical expertise to the sales and service teams at Quality Scales Unlimited in Byron, CA. He enjoys everything mechanical and electronic, computers, the internet and spending time with family.